Description: This hot-air rework station is great for professionals and hobbyists in need of tight temperature tolerances and large air flows. 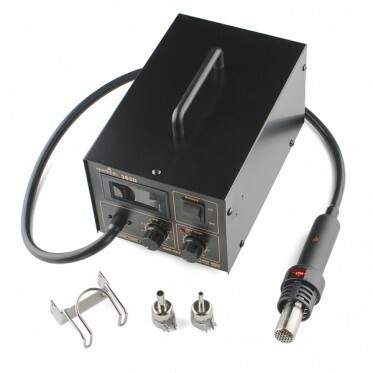 This unit displays a digital readout of the actual air temperature with a flow rate of up to 23L per minute. This very powerful unit can be used for multiple applications including standard SMD reflow/repair/removal, thermal IC stress testing, thermoplastic welding, and shrink-wrapping.